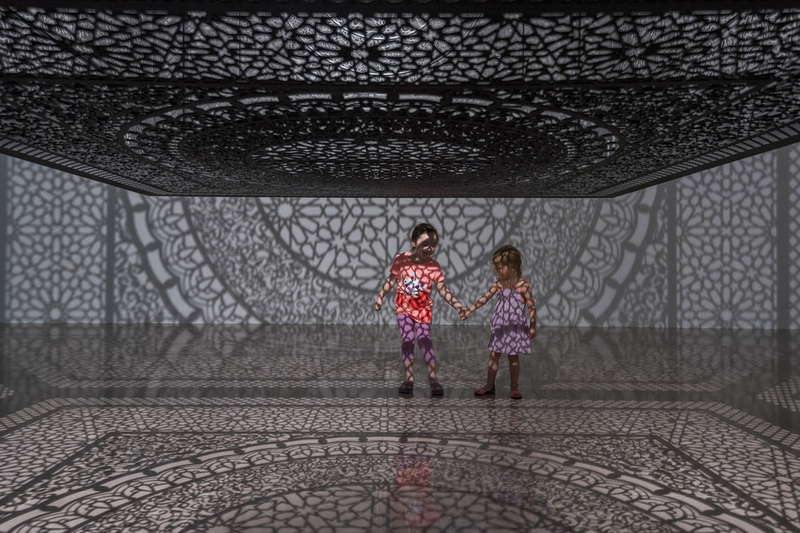 Pakistani-American artist Anila Quayyum Agha uses light and cast shadow to transform Rice Gallery into a place that alludes to Islamic sacred spaces dense with geometric ornamentation and pattern. Intersections was inspired by Agha’s visit to the Alhambra in Granada, Spain. Built in the 9th century as a castle fortress, the Alhambra fell into ruin before being restored and reconstructed from the 11th – 15th centuries by rulers of the last Muslim dynasty in Spain. Today, the Alhambra is a UNESCO World Heritage site where visitors can marvel at interiors in which every surface is covered with the complex, interlacing designs of Islamic art. Agha translated these contradictory feelings into her installation, Intersections, by creating a contemplative space of her own making that is open to all. She used simple means to dramatic effect: a single, bright light suspended from the ceiling shines through an intricately laser-cut box made from wood and painted black. Each side of this cube is the same, repeating a symmetrical pattern Agha designed by combining and adapting different decorative elements she saw at the Alhambra. The geometric shapes and lines become shadows that cover the gallery walls, floor, and ceiling, and even gallery visitors. Within Intersections, no clear boundary or separation exists; our moving bodies change the nature of the pattern as we walk freely through its dense silhouette. Anila Quayyum Agha was born in Lahore, Pakistan in 1965. She received her BFA from the National College of Arts, Lahore, and an MFA in Fiber Arts from the University of North Texas in 2001. She has had solo exhibitions in the United States, United Arab Emirates, and Pakistan. Residencies and awards include the New Frontiers Exploratory Research Grant, Indiana University (2013); New Frontiers Travel Grants to Mazatlan, Mexico (2012), Spain (2011), and Pakistan (2010); and a Houston Center for Contemporary Craft residency (2005). Intersections was awarded the Public Vote Grand Prize and split the Juried Grand Prize in a tie at the 2014 ArtPrize competition in Grand Rapids, Michigan. Agha is currently an associate professor of drawing at the Herron School of Art & Design at Indiana University Purdue University Indianapolis. Rice University Art Gallery Patrons provide major support for Rice Gallery exhibitions and programs. Rice Gallery Members, the Robert J. Card, M.D. and Karol Kreymer Catalogue Endowment, and the Leslie and Brad Bucher Artist Residency Endowment provide additional support. Rice Gallery receives partial operating support from the City of Houston. Central Market, KUHF-FM, Saint Arnold Brewing Company provide in-kind contributions. Intersections is presented with the support and collaboration of The Boniuk Institute for the Study and Advancement of Religious Tolerance, Rice University.